Wisdom teeth removal is an outpatient procedure performed on 5 million Americans each year. 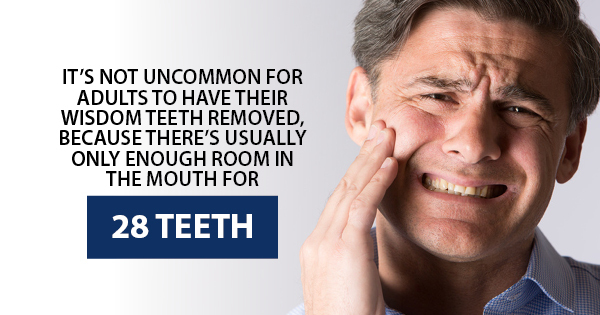 And the fact is, it's not uncommon for adults to have their wisdom teeth removed, simply because there's usually only enough room in the mouth for 28 teeth. But it's not always easy to determine when your wisdom teeth actually need to come out, and this can cause many people to avoid seeking out a licensed dentist. Not getting your wisdom teeth out when they're impacted can lead to a number of serious and potentially permanent issues. Here are just a few reasons you should never put off your wisdom tooth extractions. Gum disease is extremely common, but those who have impacted wisdom teeth that haven't been removed are even more prone to developing the condition. But more than half of the adult U.S. population surveyed over age 50 agree that a smile is the one physical feature that stays the most attractive as we age, according to a survey by the American Academy of Cosmetic Dentistry, so make an appointment with a licensed dentist and get those teeth extracted as soon as possible to prevent prolonged damage to your gums. Once your gums become irritated as a result of wisdom teeth impaction, it won't be long until your teeth start to decay and become damaged as well. If left untreated, they could even cause permanent damage to the point where you may need crowns, veneers, or implants. Avoid the cost of dental implants by seeing a dentist and having your impacted wisdom teeth removed before it's too late. In rare cases, impacted wisdom teeth can cause issues involving tumors and cysts. They may not always be easy to locate, and this is a very complex issue. See a dentist right away if you're feeling pain that you think may be the result of a wisdom teeth-related cyst or tumor. According to an AACD survey, virtually all adults (99.7%) surveyed believe a healthy smile is socially important, and understanding the risks of avoiding a wisdom teeth extraction can prompt you to make a trip to the dentist and get an x-ray to determine the condition of your wisdom teeth. For more information about the cost of dental implants and other restorative procedures, contact Dental Arts. >I felt more at ease coming to Dental Arts. This was my second visit. And I will always be coming back here for all my dental needs.